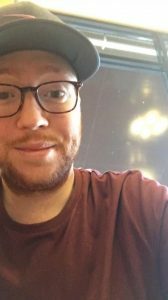 I am Joshua Tullett, a 21 year old university graduate and at the time of writing this I am just over 6 weeks into my recovery from PEARS surgery in October. Being 21 and having heart surgery is not something you hear every day. I have Marfan syndrome and have known this for as long as I can remember. I am physically active and have played numerous sports throughout my life and tried to not let my Marfans get in the way of me doing what I love. However, sadly it does affect me and I feel like it hinders me at times, especially when I went to university and played for the hockey team. I have never been the fittest player in the teams I have played in and I can’t train as hard as some of the other players, as I always had one eye on my heart and the dilation of the aorta. It is something that I have never truly expressed until now. But I have played cricket now for pushing 16 years, hockey for 7 and golf for around 4 years seriously. Sport really is my lifeline and an industry I hope to work in, in the future. Marfan syndrome runs in my family, seemingly with the men in the family suffering from the syndrome the worst. My grandad had Marfans and died at a tragically young age from an aneurysm and my uncle has had 2 major heart operations now. So with the family history of Marfans and my annual check-ups at the Royal Brompton showing an increased dilation, surgery was mentioned. PEARS for me was a preventive measure, which hopefully will safeguard me against major problems in the future. So, rewind to 2017. I was in my 3rdand final year at university, meeting numerous deadlines for assignments and writing my dissertation so life was already stressful. I went for a routine check-up and sat down with the doctor and my parents and the usual chat ensued. Then the word “surgery” was mentioned and my stomach dropped to the floor and my brain seemed to go into overdrive and then just shut off for a few minutes. After it had sunk it, we started talking about PEARS and what the whole process would be. I felt numb. I couldn’t believe that as an active 20 year old I was being told I could be having open heart surgery. It was something that I didn’t think would be happening until I was older. I went back to university shortly after that, told my tutor what the situation was and burst into tears in his office, everything was too much at this point. We had tragically suffered 2 deaths in the family in 2017 so I already felt on the edge of my breaking point. However, the staff and my friends at my university in Southampton were fantastic and supported me every step of the way. The whole process was seemingly simple, a few blood tests here and there, a couple of scans, get the support made, get a date, have surgery, recover. However, for me, things were a bit up and down throughout the process with dates changed and more scans needed. But to cut a long story short, I was meant to be having the surgery at the Royal Brompton hospital in July but eventually ended up being sent over to St Thomas and Guys under the care of Conal Austin (hero) and having the surgery in October 2018. So, October 2018. The month it finally happened. Monday 15th: We woke up at home and there was an odd feeling around the house. Nobody quite knew what to say to each other. But we headed out to London on the train from Ramsgate which luckily didn’t take too long because I don’t think I could done a long journey with how nervous I was feeling. We arrived at the hospital around 4 o’clock and I was admitted and put into a 4 bay room with 3 older gentlemen. I felt extremely out of place, being the youngest on the ward by possibly 40 years. The nurses and care team were brilliant, I think I was a bit of commodity, being a younger lad in there. On the Monday evening I was visited by a host of medical professionals, with some tests carried out and some general chat about the surgery, their roles and what tomorrow would bring. There was some news that left me reeling, they still couldn’t say 100% that I would be having my surgery tomorrow or even that week. If an emergency case came in, I faced the prospect of being sent home as my surgery was classed as elective and I was a healthy 21 year old. Eventually everyone left, my parents went to their accommodation on the hospital grounds and it was time to try and get some sleep. I think I was so nervous and hyped up all at the same time throughout the day and the time I was sitting in that hospital bed that afternoon that I just crashed that night and had a decent sleep luckily. Tuesday 16th: Operation day. It was finally here. Around 7:30am I was woken up and my parents came in a short time after and we were told they STILL couldn’t tell me if my surgery would happen today, with it being scheduled to start at 9am. That was possibly one of the worst waits of my life. Everyone was asking me if I was alright and I kept reassuring them I was and I fronted in out with a smile but inside I was shaking like a leaf because of 2 things. One, the surgery might not happen and two, I could go down for surgery and that could be it. I might not wake up again. This seriously could be the last time I see my parents but I was confident in my surgeon. Try not to bottle up how you are feeling. It is a big procedure and moment in your life and it’s ok to not be ok. I didn’t really open up to anyone about how I felt going into the surgery but now I will freely talk about how I felt. I put on a front that I was ok and that took its toll on me. You want to try and go into surgery as healthy as possible, both mentally and physically. 8:22am: It was finally time, it was finally happening. I was taken out of the bay by a couple of lovely nurses and wheeled down to thelift and through the corridors. It finally hit the point where my parents couldn’t come any further with us. And a few hugs later that was it, I was wheeled into the pre-op room and a team of medical professionals were there waiting for me. Laying on the bed, my mind was scrambled, but I remember thinking about the last time I saw my girlfriend before today and I just started smiling and then I started chatting to a couple of nurses about why I had started to smile and then the overwhelming sense of relief hit me that it was finally happening. And as a tear rolled down my cheek one of the nurses wiped it away, reassured me I was in safe hands and that was it. I was asleep. It was odd in my brain in that short window before I was put to sleep because I was so excited it was happening yet terrified but I knew I was in safe hands with Conal Austin. Tuesday afternoon: Overnight Intensive Care Unit. What a place. What a remarkable group of people. I was apparently woken up and could function enough for them to take my breathing tube out which luckily is something I don’t remember at all. I remember comprehensively waking up and talking to the nurse and my parents walking into my bay. I HAD MADE IT. I looked up at the ceiling and breathed a gentle sigh of relief, I felt far too delicate to take a deep breath this early after surgery. So, recovery starts here is one of the first things I thought when they sat me up in my bed. I had tubes and wires all over me, which was unpleasantly uncomfortable, I felt sore, lethargic and also in a lot of pain. I was on Fentanyl along with a cocktail of other drugs which helped tremendously. I don’t remember clearly a lot about that day apart from my Dad taking pictures of me to show me how I looked…ROUGH! I think I slept for a lot of the day and that night was a tough one. I was awake every so often just through sheer discomfort and the occasional test here and there. But it then rolled into Wednesday. Wednesday 17th: Moving day! The morning came and the tests continued, being monitored at every turn. My surgeon came round to see me and told me that I was looking great and it had all gone off without a hitch. This was so reassuring for me to hear. I remember getting out of bed today, shuffling around and trying to stomach some food which did not go down well at all. Remarkably I was out of bed today and sitting in my chair. I felt like this was one massive step in my recovery already achieved. I was worried that I wouldn’t be steady on my legs but I managed with a little guidance from the nurses. The typical process after my heart surgery would have been to have been moved into the High Dependency Unit attached to my original ward but I made great progress and was allowed to head straight back to Dalton ward this evening after my chest drain was taken out. This evening I was wheeled out of Intensive and headed back to Dalton where I was greeted by a host of nurses so genuinely happy to see me back so soon on the ward and looking well. However, I got a slight temperature this evening and had possibly the single worst night’s sleep of my life. And again, every few hours I was awake for blood pressure and temperature readings. At the time it does get slightly irritating but they have to do it and it’s for your own good so I told myself to stop being ungrateful. Thursday 18th: Business as usual. So Thursday morning comes with light streaming through the blinds and filling the 4 bay room, giving me a beautiful view of London and the Parliament buildings. I woke up needing the toilet, so called a nurse thinking I would be given a vessel to fill, as that’s what I did Wednesday evening. However, the nurse came and said “come on then, up you get”. I was astonished at first that I was going to walk to the toilet not even 48 full hours after open heart surgery. I was so happy I was allowed to walk properly this soon and glad that she made me do it otherwise I would have been stuck in bed, fearful of walking again which would have driven me crazy. So fast forward through breakfast sitting in my chair, to a couple of hours later when I was moved into a single bed bay…RESULT. I was able to walk around the room when I wanted and the nurses encouraged me to walk around as much as I could and do my breathing exercises, which I was more than willing to do. 2 o’clock rolls round and my visitors for today stroll in. My Mum and Dad brought in my Aunty Caroline and my girlfriend Milly. I was so happy to see them both, but was so tired from walking (only short distances) that I couldn’t stand up to hug them properly. Also contributing factors were I had a line in my neck and my entire chest felt like it was pulling apart like a cheese-string if I moved wrongly. We all sat and chatted for a little while, they brought me presents to keep my mind active and some snacks…yum. After seeing me stuck on an intensive care bed 48 hours ago, I thought it would be reassuring for my parents and relieving for Milly and my Aunty Caroline to see me walking around the ward. So Milly and I set off on a gentle…slightly less romantic stroll around Dalton ward. We saw some nurses that observed my surgery so chatted to them and they told me what they saw from their side of things which was fascinating for Milly and I. Fast forward to the evening, I felt very tired and sore from walking that day and generally a bit whacked out. I slept like a baby. I was worried about sleep quality post-surgery but once I was out of Intensive Care and my body had already started to heal, I slept fine. If you struggle to sleep, bell the nurses and they can also help you out. Friday 19th: Another day, another ward walk. Friday morning came around and I was woken up to great news. I was recovering well, blood pressure was stabilising, lines and wires were finally being taken out today and…I was given the lushest cup of tea to ever pass my lips. Lovely start to the day. The nurses came in and finally took out the cannulas in my hand and the line from my neck which was one of the biggest reliefs I felt. I was able to walk moreeasilywith my head up high and once again could walk with pride in my step. I was moved out of my single bay room and into a 2 bay room with a lovely view across Westminster. And finally…I could shower which was a huge relief. To wash my hair and get my scar cleaned up, it felt like a weight had been lifted off my shoulders. The day was much the same as Thursday but with the exception of a different visitor, a very close friend of the family. It was touching that he made the effort to skip across London and come see us and check on me and my parents. With everything, time catches up with you and it was time for my girlfriend to head back home so I walked her to the lifts, which was nice for me to stretch my legs and for her to see me walk that far. This evening was a little bit of a struggle, I had a slight temperature and an elevated heart rate which was nothing too concerning but if it didn’t settle down by the morning then I wouldn’t have been discharged on Saturday and would have been kept in for another night. Saturday 20th: Home time. Today was the day. My temperature settled down after a good sleep and a nice morning shower. The morning was much of the same, walked around the ward every so often, watched YouTube on my phone, had some food and got my bag packed and ready to go. 2 o’clock rolled round and a host of people came and spoke to me about how I was doing, how I was healing and finally a pharmacist sorted out my medication and that was it…I was free to leave with my parents. I strode out of the ward thanking all of the nurses and care team as I left, down in the lift and out the front door to get a breath of fresh air. Now to get home…the tricky part. We were debating whether to get a taxi back to Ramsgate or the train, we settled on the train after speaking to the lead nurse on the ward and on the basis that it was a Brexit march day which would mean getting a taxi to us could take an hour then driving through London would have been horrendous. Long story short, to my parent’s astonishment I made the decision that we would walk to London Waterloo as it was going to be too long to wait for a taxi to get us to St Pancras. 2 hours later, we were back in Ramsgate and I was sitting back in my chair thinking “what on earth has just happened”. So as I mentioned earlier I’m 6 ½ weeks into my recovery now and it is going very smoothly. The scar is already healing extremely well and a lot quicker than I was anticipating. Tuesday saw me attend my first Cardiac rehab session which everyone is offered post-op I believe and it is going to be fantastic. They have offered me sessions twice a week with a health and lifestyle talk on one of the days and I cannot wait to start next week. As sport plays such a big part in my life, it is going to be so good for me mentally as well as physically to start moving again. In the last 6 weeks since I’ve been home I have been restricted in what I can do physically and have started to complete adult colouring books to get my mind going again and keep my occupied. To anyone reading this, interested in the PEARS procedure, I recommend it highly. Do your research and talk to all of the medical professionals you can and make sure it’s right for you. Try not to think of it as something that it going to lay you off for months but as a temporary pause in your life which could save you from having further or more serious complications down the line. There may be changes in your health following the surgery and it is important not to panic. My heart beat was louder and harder than normal post-surgery but that is a normal reaction after a surgeon wields a sharp instrument near your heart. Also my heart rate was quicker than it was pre-surgery but this is also normal and will settle down over time. It’s very common. Talk to your medical team if you have any concerns and they will explain it all to you. I would like to thank Tal for inventing this wonderful procedure and rolling it out to people like me. Without it I think I would have had to have played a waiting game to see if my dilation got bigger and that would have probably stopped me playing the sports I love. I hope more and more people are offered the procedure and it works for them as well as it has done for me.